Help Sponsor American Kestrel Conservation and Research in Idaho’s Treasure Valley! Did you know that ornithologists have been studying American Kestrels in the Treasure Valley for over twenty years? 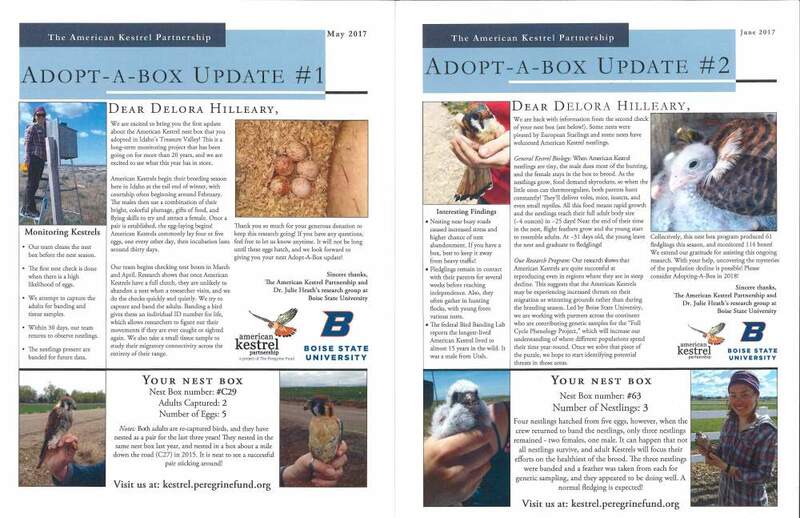 In fact, led by Dr. Julie Heath of Boise State University, the Treasure Valley hosts the one of the longest running American Kestrel nest box programs in western North America. Now, Boise State University and The Peregrine Fund’s American Kestrel Partnership are teaming up to maintain this unique resource and continue kestrel research in the Treasure Valley, and you can help! Each year, students from Boise State University monitor kestrel nest boxes in and around Boise, collecting information on nesting success and survival. The information collected from these nest boxes gives us insight into the ecology of kestrels, and might help us ultimately discover the cause of population declines occurring across North America. You can help by adopting one of our kestrel nest boxes here in the Treasure Valley. 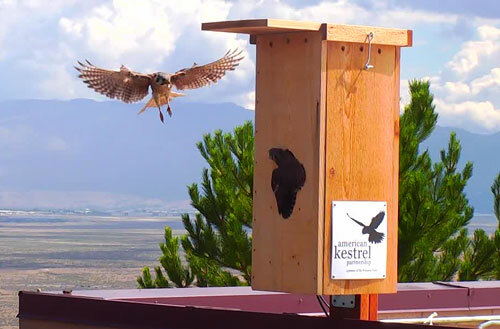 Adopting a kestrel box helps both Boise State and the American Kestrel Partnership maintain this study as we work to understand the threats that impact our smallest falcon. Funds will go towards replacing boxes, purchasing supplies, or paying for fuel to maintain the trail. Your adoption will be tax deductible. Please consider becoming a part of our team by adopting a box! Adopt-A-Box to receive an adoption certificate and breeding season updates (like the ones pictured) on your adopted kestrel nest box, all printed on high quality cardstock. Each adoption also comes with a birds of prey calendar and all the other perks of a one-year membership to The Peregrine Fund. This is a great gift for your conservation-minded loved ones!